SOS Children's Villages has been working in the Central African Republic since the early 1990s.The country remains one of the poorest in Africa, and the lives of children have been blighted by years of political unrest and violence. Bouar is located near the Cameroonian border and has a population of roughly 100,000. It is the capital of the Nana-Mamberé prefecture. The region has been repeatedly affected by rebel attacks in recent years and Bouar has received a great number of displaced people from the north of the country. This has led to very difficult social circumstances, especially for children. Poverty, malnutrition and a lack of education are common. Living conditions are substandard, and basic services are often not available. Even the water supply is unreliable, which can lead to the spreading of waterborne diseases such as typhoid fever and parasitic infections. Access to health services and education is not sufficiently available either, especially for girls. Girls are also often at a disadvantage when it comes to education because parents choose to keep them at home to help with domestic tasks or farm work. To many parents, their daughters’ education is not a priority. Early and forced marriage remain common – in fact, 61 per cent of girls in the Central African Republic are married off before the age of eighteen. The girls have no choice in the matter and, if they have been attending school, early marriage means the end of their education. SOS Children’s Villages began its work in Bouar in 2007 with the implementation of an SOS Family Strengthening Programme. The need for support was great, as there were many children living in poverty, many who had lost one or both parents, children living with elderly, sick or disabled parents, as well as children who had become the head of the family. Such children are generally unaware of their rights and struggle to survive. Often, they do not even have a birth certificate, which makes access to social services and education very difficult. The SOS Family Strengthening Programme identifies vulnerable families and provides assistance, for example by ensuring children and young people can go to school or vocational training, as well as providing literacy training to parents. SOS co-workers visit homes and provide counselling and education on HIV/AIDS and general health matters. In addition, dozens of families have received micro-loans in order to start up their own income-generating ventures. In recent years, we have expanded our family strengthening programme so as to reach as many struggling families as possible. The aim is to alleviate hardship and maintain family stability so that children will be safe and protected and grow up in a loving home. The SOS Social Centre in Bouar ensures that children have access to essential health and nutritional services, as well as education. In cooperation with local organisations, we also work towards strengthening support systems for vulnerable families within the community. The SOS Medical Centre here in Bouar can see up to 12,000 patients a year and provides basic medical care, information on preventive measures and counselling to people from the region. We make sure the children have all essential vaccinations and we offer information on family planning to the young adults. We provide anti-retroviral treatment to those affected by HIV, especially to prevent mother-to-child transmission during pregnancy. A pedagogue and a social worker are also available to serve the needs of the local population. The children attend the SOS Kindergarten together with children from the neighbourhood, which ensures that they are integrated into the local community from a young age. 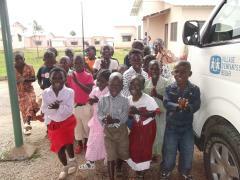 They then go on to complete their primary education at the SOS school here in Bouar, which is attended by 210 pupils.